It turns out FDR was right about fearing fear. Fear of an epidemic is sweeping a dystopian Brazilian city not completely unlike São Paulo, but the disease is essentially fear itself. A shy ten-year-old boy never thought of himself as courageous, but he just might find the insight and wherewithal to combat the strange phenomenon in Gabriel Bitar, Andre Catoto & Gustavo Steinberg’s Oscar-qualified Tito and the Birds (trailer here), which opens this Friday in New York. Tito is a smart kid, but he carries a lot of emotional baggage, much of it stemming from his parents’ separation. He blames himself for the explosive failure of the experiment that got his scientist father thrown out of the house. Young Tito is also obsessed with rebuilding his dad Rufus’s ornithological machine that would allow people to communicate with the birds. It turns out, he is not the only one interested. Rufus was subsequently recruited by the villainous media and real estate tycoon Alaor Souza, but his tenure was not a happy one. Rather inconveniently, he had his consciousness transferred to a pigeon, but at least that allows him to visit Tito. If Tito manages to perfect their family invention, he could learn more than the truth about his father. Evidently, the pigeons are carrying some deep ancestral memories that could give people the courage to fit the fear-driven pathogen turning the infected into quivering Shmoo-like blobs. You kind of have to just go with that last part about the birds, but in general, the allegorical elements of Tito are smartly developed and resonate on a deep level. Some critics will surely try to weaponize the film in their broadsides against Trump and Bolsonaro, but the its themes do not fit into a neat ideological box. Cautionary warnings regarding debilitating effects of fear can just as easily apply to the risk-averse drive for nanny-state regulation as it does to border walls and gated communities. Be that as it may or may not be, the over-riding reason too see Tito is the stunning animation. 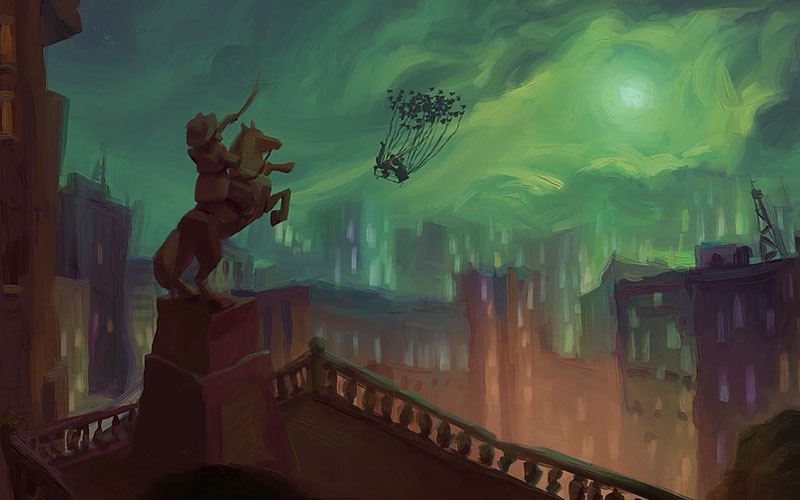 Bitar, Catoto, Steinberg, and their team of animators blended conventional digital animation with classical oil painting to create a truly unique look for the film. It is often sinister-looking and expressionist, but also lush and colorful. When you watch it, you literally feel like you are sinking into this world. Other films like Jean-François Laguionie’s The Painting has employed roughly comparable techniques, but Tito’s imagery and cityscapes are truly distinctive. As an added bonus, Tito also functions quite well as a family drama and story of friendship. The title character has compelling relationships with his three companions, Sarah, his brash platonic best pal, the nervous but resourceful Buiu, and the Teo, his former bully who matures into friend during the course of their adventures. In addition, Tito’s search for his father hits all the classic archetypal notes, but also features plenty of unique, ornithological wrinkles unique to itself. Tito is a terrific example of how animated films can genuinely be a form of high art. The artistry and craftsmanship are remarkable at every level, including the subtitles, which we understand are quite accurately translated. Even though it is fully qualified for Oscar consideration, it is exactly the sort of film the Academy is likely to overlook, along with the similarly worthy Have a Nice Day, Maquia: When the Promised Flower Blooms, The Night is Short Walk on Girl, and Sgt. Stubby: An American Hero. Honestly, on both a technical and emotional level, Tito can definitely hang with (and arguably surpasses) Spider-Verse, so it really deserves attention from Academy members and general audiences alike. 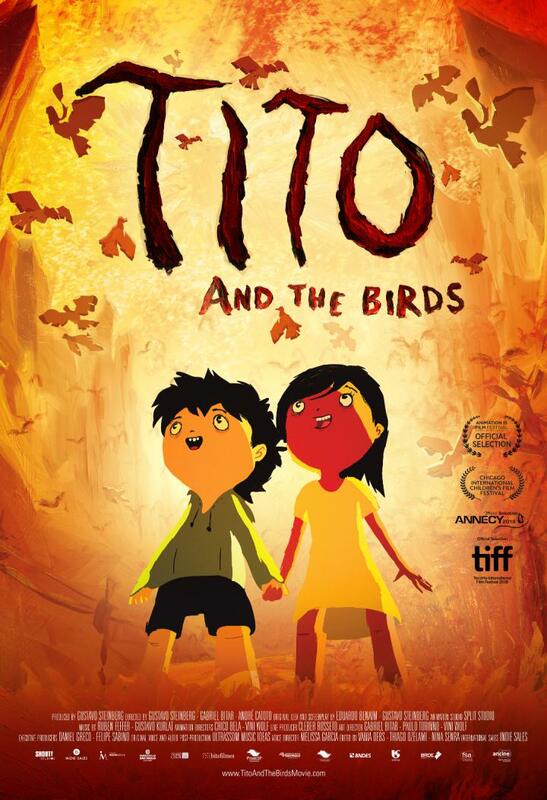 Very highly recommended for anyone who takes animated filmmaking seriously, Tito and the Birds opens this Friday (1/25) in New York, at the Quad.